Household storage doesn’t have to be expensive. With this tutorial you will learn how to make a high-end looking DIY rope basket using an old box and twine. I love our home. I really do! But there is one thing that makes it really annoying. Let me back up a little bit. You see, we liver in a split foyer house, which means that right when you enter you have to choose between going upstairs or downstairs. 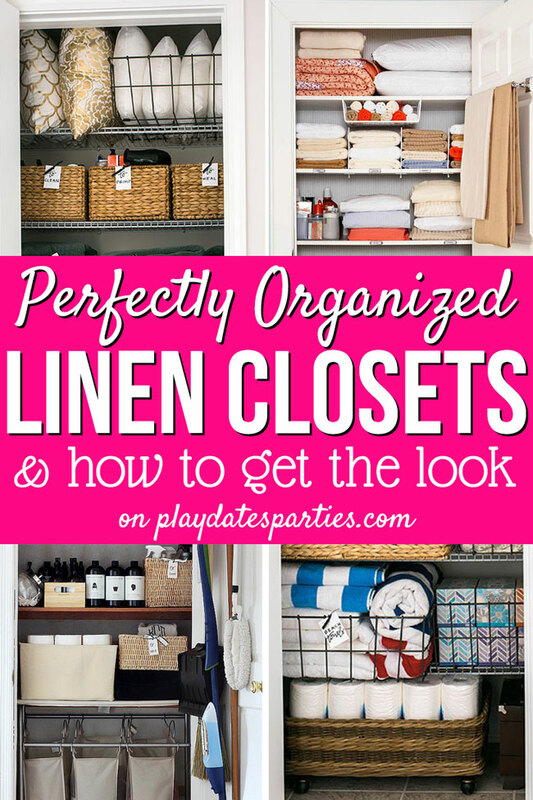 There’s barely room for more than one person at the door at any given moment, and there’s no coat closet on the main level. …who have a hard enough time remembering to put their coats on the hooks in the hallway. So winters often turn our main living level into a mess of jackets, hats, gloves, and scarves strewn all over the place. For many years we tried to keep the clutter at bay with a fabric storage tote, but it just wasn’t working. As items went in and out, the storage bag would lose shape and slump over, looking horribly cluttered. 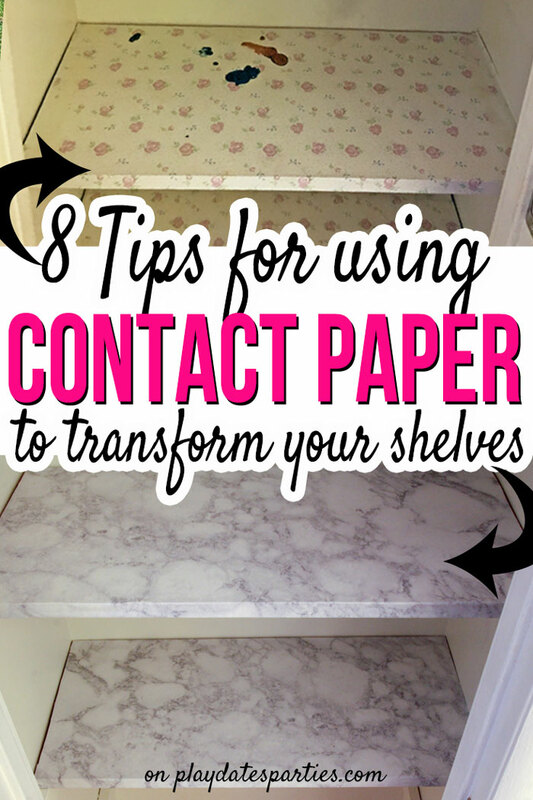 Keep the clutter almost completely hidden from sight. The challenge is that the opening I wanted to use itself is a very awkward size at 16”H x 11.5”D x 20.5”W. And the cost of a basket that would only fit half the height of the opening can run close to $50! Honestly, I nearly gave up on the whole project. Then, one day I realized that an economy size box of baby diapers is practically the perfect size for our space. All I had to do was find a way to turn an ugly baby box into something pretty. And after raiding my fabric stash, lots of glue sticks, some twine, and plenty of time, I had a beautiful DIY rope basket for barely more than $25! Even though this DIY rope basket is made with a cardboard box, it looks fantastic inside and out, giving the whole project a high end look. 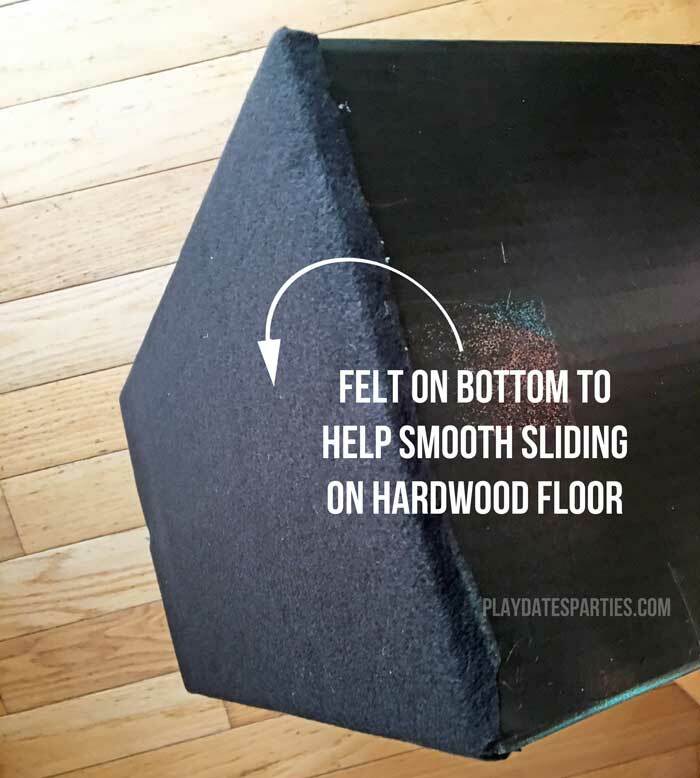 I used extra fabric to glue in a liner to make the inside pretty, and a felt bottom makes the box slide easily in and out of the shelf opening without scratching the hardwood floor. You would never know that this used to be a diaper box! 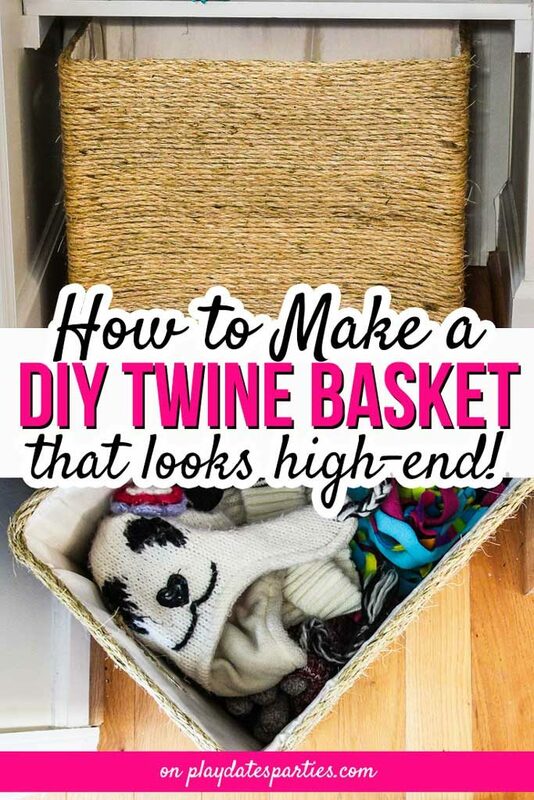 Now everyone’s hats, gloves, scarves, and sunglasses are easy to find, and almost completely hidden from sight…well, that is when the kids actually remember to put their things in the DIY Rope Basket! If the box has an opening at the bottom, glue one of the flaps over the inside of the bottom for stability. Spray paint the inside and outside of the box. For the inside of the box, choose a color that closely matches the fabric of the lining. For the outside of the box, choose a color you don’t mind showing between any possible gaps in the twine. Drape the lining fabric over the outside of each side and the bottom of the box. Cut pieces of fabric with at least 1/2 to 1 inch extra around each edge. This will give you plenty of room for a “seam”. You should end up with 5 pieces of fabric. Place one piece of lining fabric along the inside of one of the sides of the box. 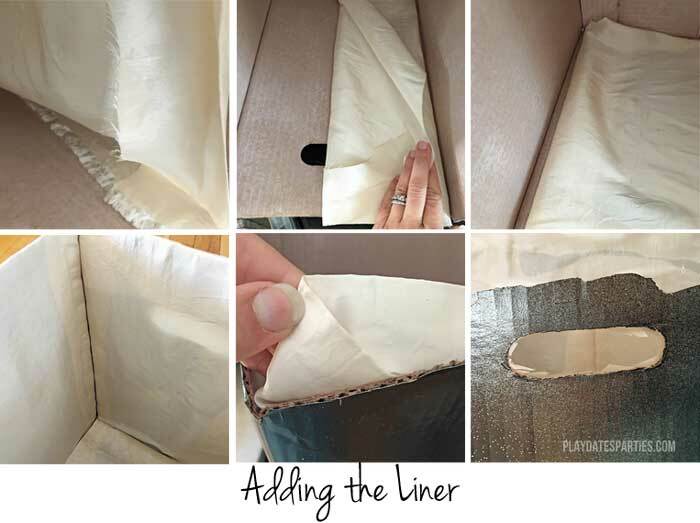 Fold your lining fabric under by 1/2 to 1 inch along one of the vertical sides and glue the folded portion as close to the corner of the box as possible. 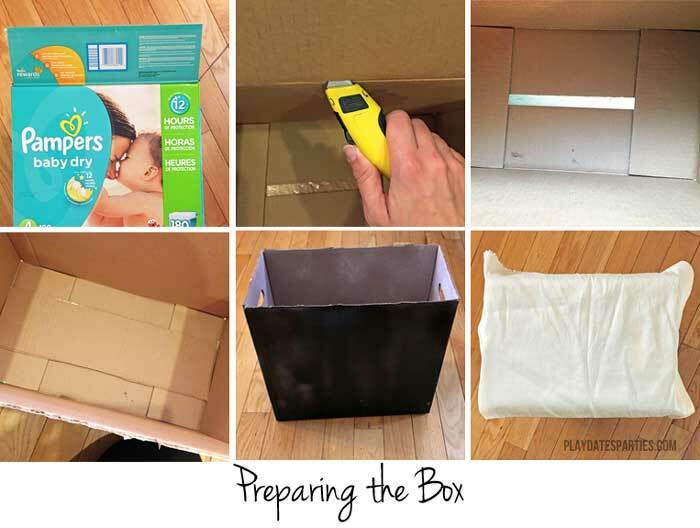 When the glue is dry, fold the lining fabric at the bottom of the box and carefully pull the lining fabric taught as you hot glue the fabric as close as possible to the bottom corner of the box. 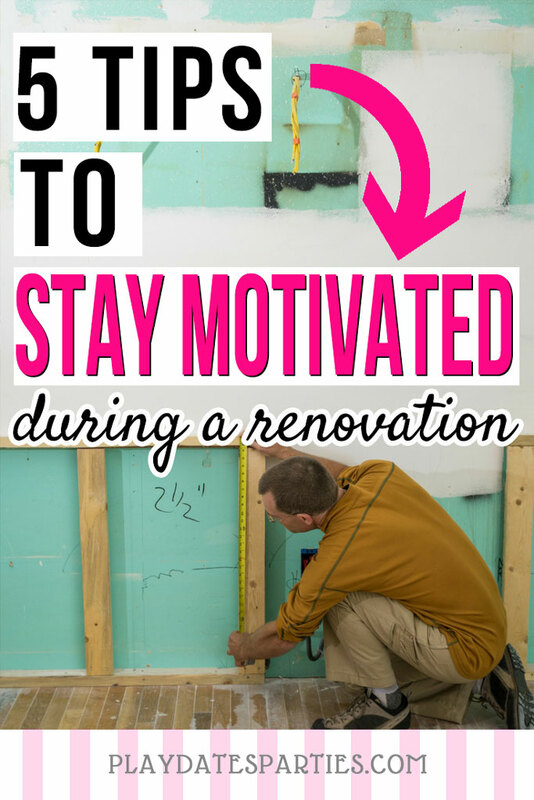 Stop gluing the lining when you get about an inch away from the next corner. Repeat steps 1 through three with each of the sides of the box, finishing with the bottom piece of the box. When finished, the glued lining should look similar to sewn seams of a fabric liner. Fold the top edges of the fabric over the top of the box. Fold the corners of the fabric under like a present and glue each flap down onto the box. If your box has handles, carefully cut out the lining with scissors at the openings. 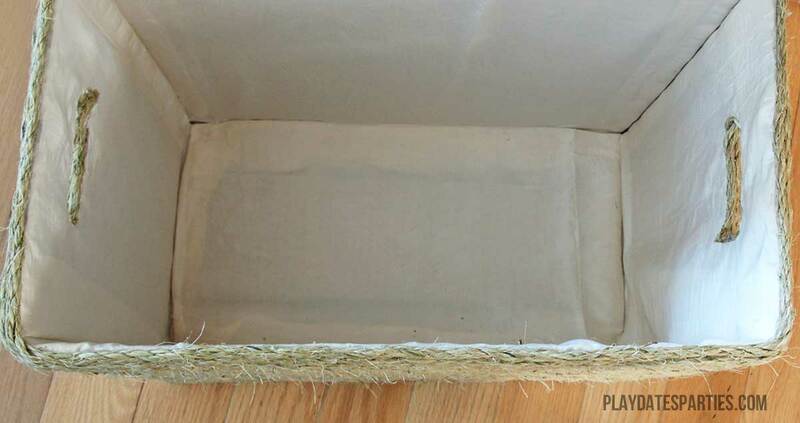 If desired, hot glue a piece of felt to the bottom of the box before adding twine. 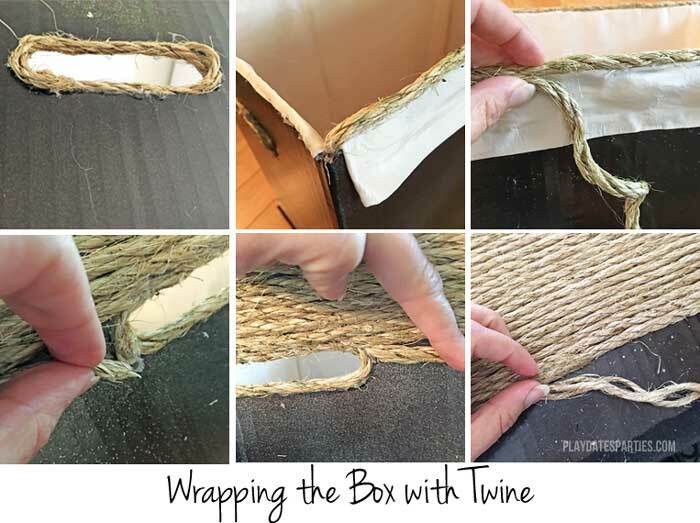 If your box has openings for handles, start by gluing a piece of twine just inside the opening, making sure to cover the edges of the liner with the twine. This should have the effect of gluing down both the lining and the twine at the same time. Starting at a top corner of the box, begin hot gluing the twine onto the box in sections of 6 to 8 inches at a time. As you wrap the box, the twine will try to unwind. After applying hot glue, quickly twist the twine back into place and hold it tightly against the previous row to hold in place. This will also help to reduce gaps. Finish wrapping at a corner of the box for the cleanest look possible. Wrapping twine around the handles: As you approach a handle, cut the twine at an angle and glue down tightly. Re-start the row at the opposite side of the handle and continue to glue around the box, cutting again as you approach each opening until you can wrap the twine underneath the opening in as straight a line as possible. Seaming together additional rolls of twine: Large boxes will require multiple rolls of twine. To create a nearly seamless look, make sure the end of the previous section of twine is glued securely. Then, snip off a small portion of the beginning of the section at an angle. Carefully add the second section directly against (almost overlapping) the previous piece of twine. Do you have any awkward spaces that would love a DIY rope basket? What is the most difficult storage solution you’ve had in your home? I’ll still buy them occasionally at HomeGoods or Marshalls, but sometimes you just can’t find the right size. This is such a clever idea! I love that it used to be a diaper box. You’re right…you would really never know! Thanks for the step-by-step guide. We have a lot of diaper boxes around here…. The inside and bottom lining make all the difference in hiding the original purpose! It looks great – and really simple to make! It definitely doesn’t take any special skills. The most difficult part was getting the liner to line up right at the corners. 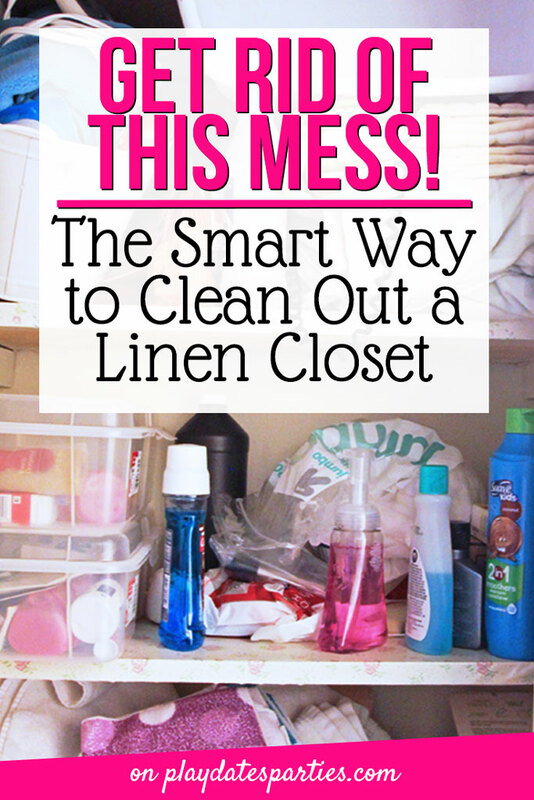 But since it’s filled with stuff that doesn’t have to look perfect, right? Thanks so much for stopping by! 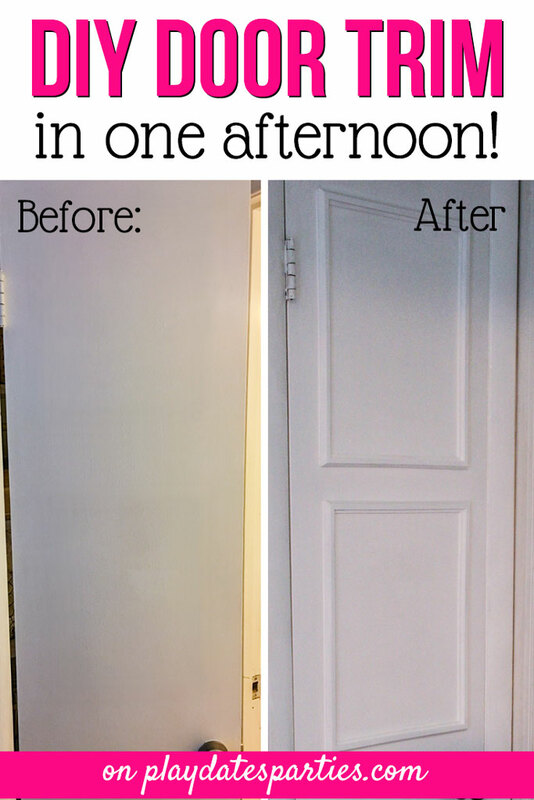 You did an amazing job transforming that old diaper box into a beautiful storage unit that perfectly fits your space. No one would ever believe it started as an old box…it looks stunning!! And…at a much better price point. Great job! Thanks so much, Tammy! I was motivated first by the awkward size, and second by the price. You know what they say…necessity is the mother of invention! Now, this is what I’m talking about! It looks just like you bought it at a store! Awesome 😀 pinned! Thanks so much Angie! I may even have another version or two in our future, so stay tuned! You are so creative! Pinned and shared. What a great idea! I love how it looks! Thanks for sharing at Together on Tuesdays. 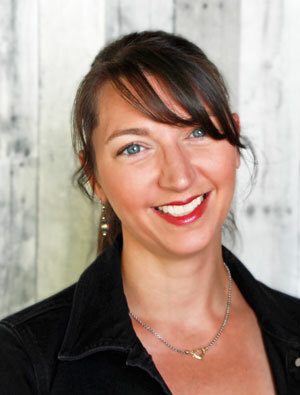 Thanks for sharing with us at the Hello Fall linky party. Pinned. Thanks so much for hosting…and for stopping by! It really can be frustrating to find the right size box. Thanks so much for hosting! Totally pinning this!! Thanks for sharing on the Pleasures of the NW’s DIY party. Thanks for pinning and thanks for stopping by! Wow! I love this so much. I’m wondering if I have enough twine already. I know I have plenty of boxes, lol. I am curious though, why spray paint the inside and outside if you just cover it up? Great questions Adelina! I spray painted the inside of the box because the lining fabric I used was fairly thin and a bit sheer. It may have been overkill, but I wanted to make sure that there weren’t any dark spots showing through the fabric. As for the outside of the box, there’s almost no way you can guarantee that something round – like twine – will cover 100% of the box. There are likely to be spots showing through. I wanted to make sure that if that happened, the color showing through wouldn’t be the bright colors that are on the outside of the diaper box. I love this! I like how simple it is to make. I also think even my NON-crafty self can make them. 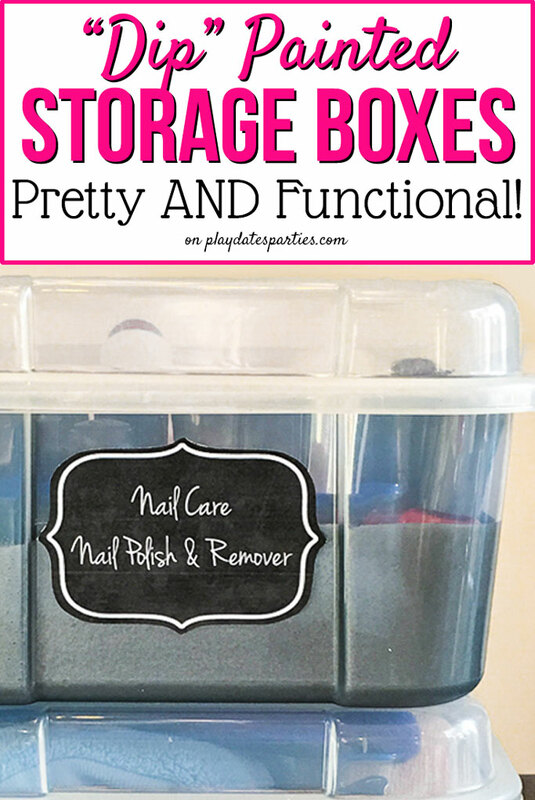 Great way to upcycle an old box that doesn’t match your decor. You did a great job. Thanks for linking up with the DIDI Crew! Love the look of this box! I’ve done fabric wrapped boxes for the same idea and appreciate the tricky work around the inside corners. Never thought to add felt to the bottom, great idea! it really turned out nice! You can do so much with rope and jute. Thanks for sharing with SYC. Oh the possibilities are endless with the sizes you can make!! 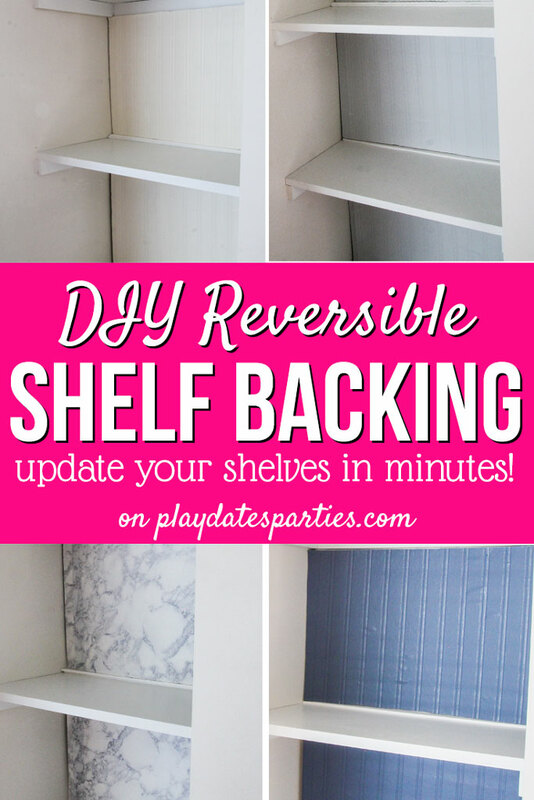 What a great idea and storage problem saver!! Thank you so much for sharing your DIY Twine Wrapped Storage Boxes with us over at Waste Not Wednesday! I never would have thought of that. GREAT idea! And, it makes an adorable gift basket that’s useful afterwards…..